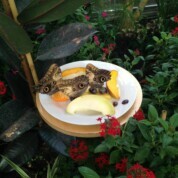 The Horniman’s latest attraction is located at the rear of the gardens, close to the animal enclosure. We entered through special curtains to keep the butterflies inside, with a warning from the staff not to allow any inmates to escape on our clothing on the way out. I can see their problem as I was wearing a butterfly on my back the second I got through the door, much to the boys’ delight. 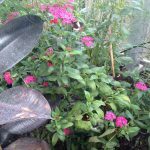 We had been given a spotter’s guide which was useful for identifying some of the butterflies, but mostly the boys just liked spotting the butterflies flying around and camouflaged on plants. 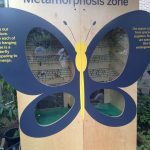 There is a metamorphosis zone where you can watch butterflies emerge from their chrysalis before your eyes, which is perfect for little fans of the Very Hungry Caterpillar. 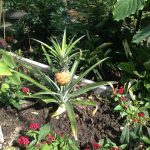 The House is quite small, but has been beautifully planted – MJ was fascinated in particular to spot pineapples growing in the undergrowth.